A Lost Soul – eternally in the state of bliss!! Varanasi, the abode of God is the spiritual capital of India. It is both elegant and chaotic at the same time. It’s elegance comes from the age old traditions and rich culture. People from all over the world are attracted towards this serene place. Kashi Vishwanath temple is one of oldest temple of India. It is one of the 12 jyothirlingas. There are 4 gates to the temple.The temple is crowded most of the times. When the crowd is huge during festivals,for visiting the temple one has to stand in long queues in the thin narrow lanes of Benaras with shops on either sides of the lanes, the shopkeeper selling the ‘Pooja Samagri’ one can experience the calmness among the chaos. The ghats of Benaras bring in the good positive vibes. Taking a holy dip in the Manikarnika Ghat gives you a sense of positivity, freshness and joy. In the evening, Kashi also known as city of lights comes into it’s true form with the magnificent Ganga Aarthi. One can hire a boat ,have a ride in Ganga viewing all the ghats and enjoy the Aarthi from the boat where one can get a clear view of it. The Aarthi is performed to thank Ganga ma for her givings by lightning the huge diyas, singing the divine songs. Last but not the least, street food at Benaras is just amazing. One can try a wide variety of chats on the streets .The rabdi (sweet made of milk) of Benaras is to die for. Annapurna trust provides free food to all the pilgrims,one can even visit it. 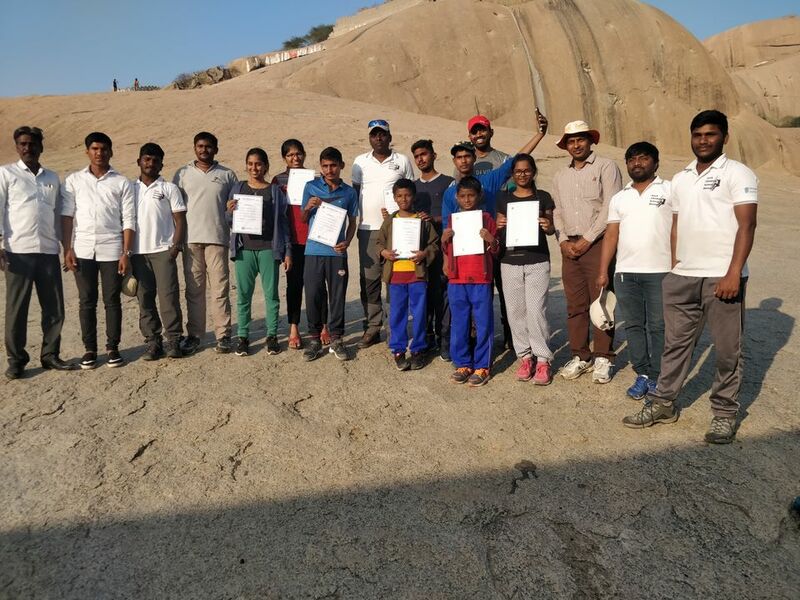 Rock climbing School, Bhongir, the school where the India’s youngest mountaineer who conquered the Everest started her climbing journey. Yes, I’m talking about Poorna Malavath, who scaled Mt Everest at the age of 13. 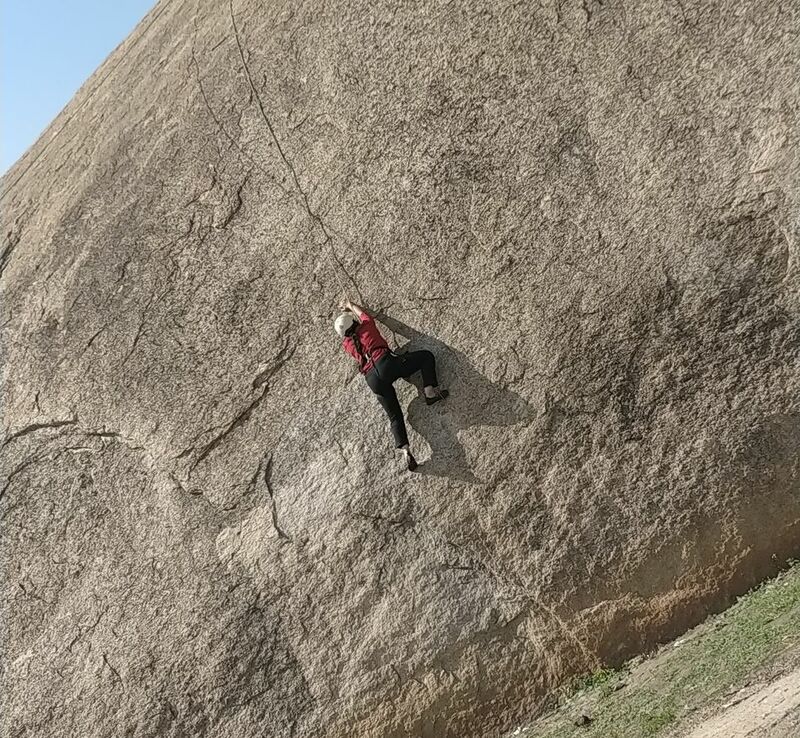 Recently I got to watch her movie Poorna ,which was nicely shot here ,it fascinated me to learn rock climbing. I have always been interested in adventure sports.So this was definitely worth trying. 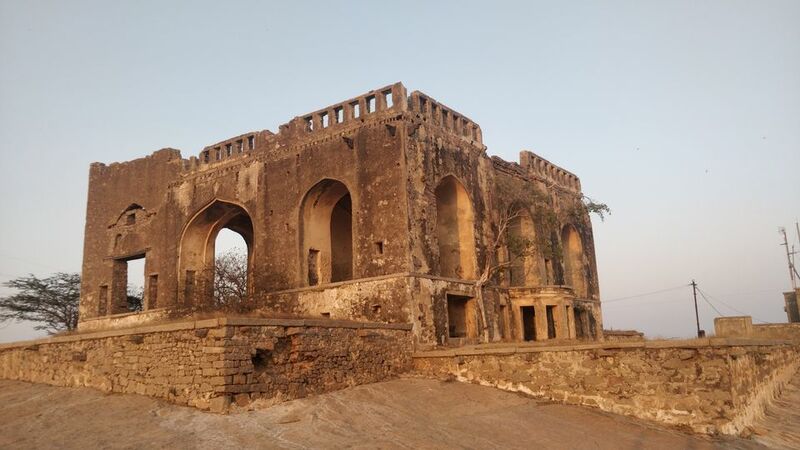 Bhongir fort being located at just 50kms from Hyderabad was perfect for weekend rock climbing course. It costed us around Rs3500 for a three day course.My friend Aiswarya and I applied for it and the course started on 28th dec.
We planned to take train from Secunderabad to Bhongir at 6:20 am. We missed two trains and finally got into a train only to realize later it is going to Vizag and not Bhongir. We were on the verge of missing the train again. We realized it soon by asking other passengers and got into right train (intercity express) at 7:40. Reached in an hour, the weather in Bhongir was pretty cool due the winds of Bay of Bengal. We took an auto ride to the school. 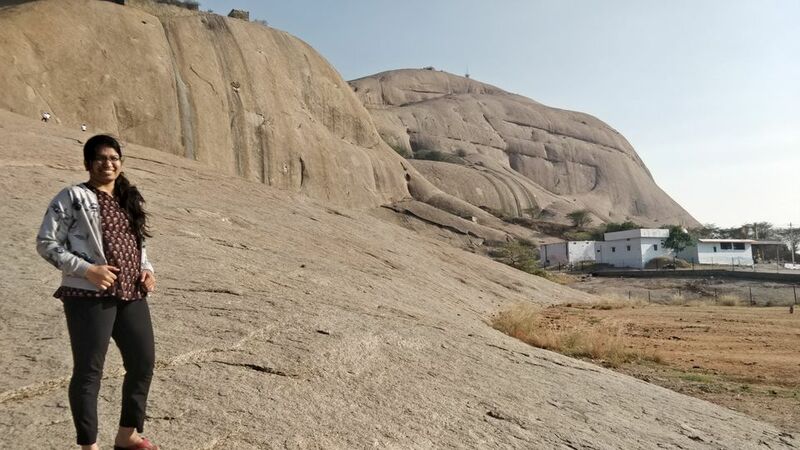 The Rock Climbing School, Bhongir is under telangana tourism run by Transcend Adventures. 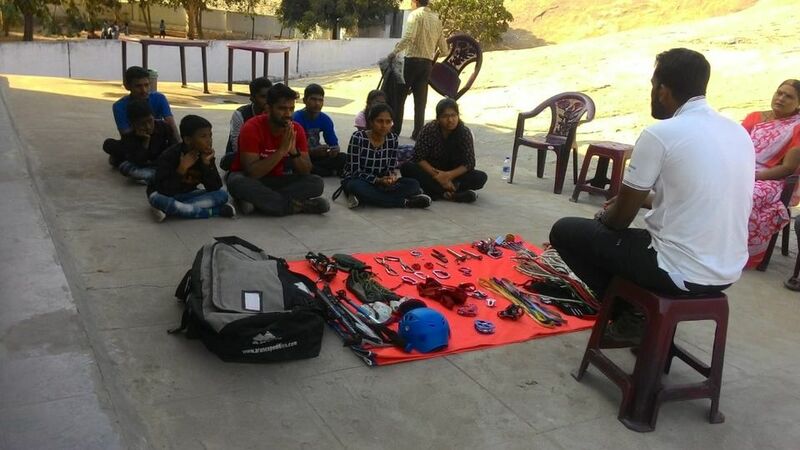 Transcend Adventures is the team which had helped many indians realize their dream of conquering everest. It being the new year weekend,we were lucky enough that course had less students and we got to try things multiple times. Our day started with us introducing ourselves to other students in the course, who were mostly under the age of 16. 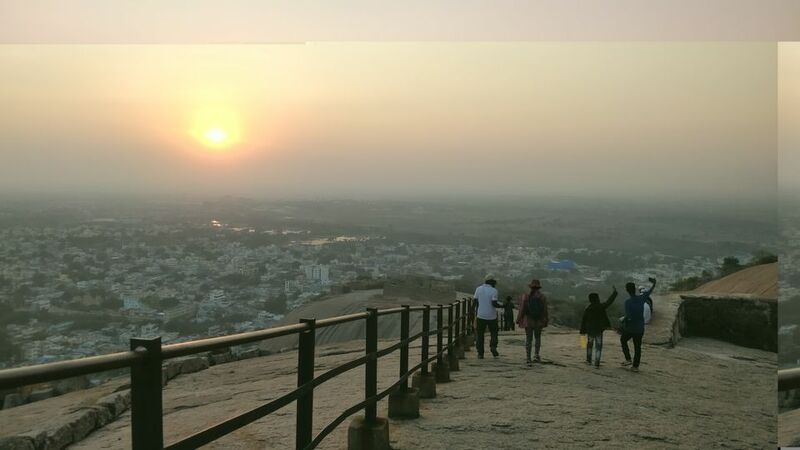 We hiked to the Bhongir fort as a warmup to our hardest climb. Our first activity was bouldering ( climbing rocks less than 15ft).We were taught different rock holding techniques . We were give rock climbing shoes for getting grip on the rock. In the hot shimmering sun, by holding the rock with hands ,putting the feet on the edge of the rock, balancing the body weight just on the tippy toes, we took small steps and with little bruises on our hands and legs indicating our little achievement ,we aced the Bouldering. After an amazing lunch in afternoon ,we had a briefing where the climbing equipment were placed and explained. It included ropes, slings, ascenders, descenders, harness, pittons, carabeaner, etc used in mountaineering. I was amazed by the way these equipments were engineered, and they looked very small without any complicated structure yet did the amazing work of balancing and supporting the climber. The next day ,we assembled at 9 in the morning ,this was the most exciting as well strainfull day of the course as we were supposed to do many things. We were taught how to walk (up and down)and balance ourselves on the normal 30 degree inclined rock , by walking on toes ,bending forward we could easily balance ourselves on this rock. While descending the rock we supposed to shout ‘ I am falling’ if we were to slip. This was so much fun as no single person was in sync in this exercise when instructor told us to fall. Next, we started climbing rock inclined at 50 degrees. There were some commands to be told when we start climbing ,reach top and descend down.The moment we reach top , we would mess up the commands which were later turned into funny topics. One guy,on reaching the top was supposed to say ‘Lower me’ to bring him down ,he, not knowing English well and in excitement said ‘low me’ in such an accent which was perceived as ‘Love me’ by everyone, and with this stint he became the center of fun everytime throughout the course. We would tease him with just by saying that. And then we tried rappelling down another rock which 90 degree inclined.This was easiest part of the course because we had to just hold the rope and walk down through the rock by laying back. After an amazing lunch ,we had another climbing session where the rock was in a mix of inclination of 60 and 70 degrees.Holding the rock, balancing the body on just toes, pushing yourself to climb the rock , finding the next edge to put feet on, slipping on the rock, trying to climb again was so exciting and tiring at the same time. 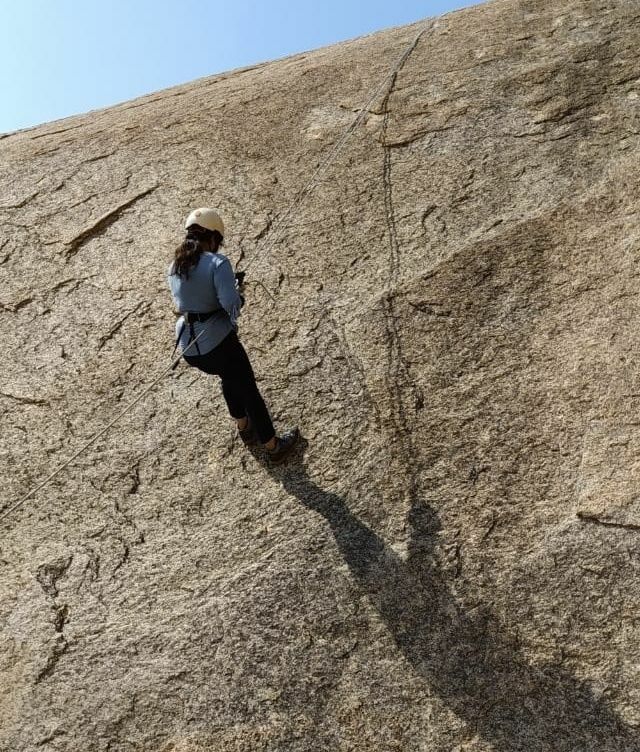 It was said that this rock climb of 3mins would burn calories of 5km running.In the evening, we learnt different knots used in mountaineering. The adventurous stories of our instructors who scaled different peaks of different continents inspired us to dare, dream and finally try these escapades. The last day was the day of exam ,applying what we have learnt. Exam includedclimbing the 90 degree inclined rock , equipment test and knot test. Most of the students passed the course with flying colors and a certificate of A grade. Finally we bid adieu to everyone and there by left the place carrying great learnings and loads of adventurous memories.